It’s no secret that getting around any city in a car can be challenging thanks to traffic, which is one of the reasons many of Boston’s residents and visiting tourists opt for the city’s MBTA trains and buses to get around. But now there’s a new way to travel from neighborhood to neighborhood with Metro Boston’s public bike share program, Blue Bikes. Blue Bikes currently has over 1,800 bikes located at more than 200 stations across several neighborhoods, including Boston, Brookline, Cambridge, and Somerville. To use this program to get from one destination to another, simply become a member online and buy a pass—Single Trip, Explore Pass or Annual Pass—from the app or a kiosk. From there, use the app or website to locate an available bike in a location that’s convenient for you to pick it up at. You’ll then unlock your selected bicycle using a ride code or your member key. After that, you’re on your own to enjoy a ride through Boston! Check your membership to determine the amount of time you’re able to take it out for each ride. When you’ve reached a destination or it comes time to return your bike for the day, head to any Blue Bike station to drop it off, as it doesn’t have to be dropped off at the same place you picked it up. Put your bike in one of the docks, and wait until you see the green light to ensure that it’s been properly locked up. No matter the type of pass you have, you can take advantage of Blue Bikes year-round, though some stations are removed during the winter months where snow removal takes priority. Unlike the MBTA, which requires you to buy tickets or add value to an existing pass at various stations around the city, the easiest way to purchase Blue Bike tickets is through the Blue Bikes mobile app. You can also grab one at any station kiosk. Single Trip ($2.50 for 30 minutes): Ideal for one-way rides, whether it’s a sporadic ride to work, meeting friends for brunch or heading to the store for an errand. If you end up needing more time, just pay another $2.50 to tack on an additional 30 minutes to your ride. Explorer Pass ($10 for 24 hours): Looking to hit up several destinations in one day? The Explorer Pass is your best bet, as you’ll get access to Blue Bikes for 24 hours for just $10. Keep your bike out for up to two hours at a time throughout the day. And just like the Single Trip, add on 30 minutes for $2.50 as needed. Annual Pass ($99): If you plan to take advantage of Blue Bikes regularly, especially as a commuter, go for the Annual Pass. For just $99 per year, you’ll get unlimited 45-minute rides. You can also add on 30 minutes with this plan for the $2.50. If you prefer not to pay it all upfront, there’s an option to pay $10/month with a 12-month commitment, making the grand total $120 for the year. It should come as no surprise that Blue Bikes advises all riders to wear a helmet, and it’s a requirement by state law for those under 16 to do so. Adjust your helmet so it fits snugly, is level on your head and make sure you buckle the chin strap to keep it in place. It may not be the most stylish look, but we promise you can take it off once you reach your destination. While there are bike lanes around Boston, it’s still a busy city, so safety first. On the note of safety, there are a few other important rules of the road to keep in mind. First, obey traffic signals as if you were riding in a car, such as red lights and stop signs. Also, the law requires that you also ride with traffic, except for areas marked otherwise. Even when you’re riding with traffic in an actual bike lane, be on the lookout for parked cars opening doors and vehicles turning. Yield to pedestrians, and go slow on sidewalks. And while this one isn’t a law, don’t text or talk on the phone while you’re riding, as you want your full attention on the road. If you’re not an avid biker, you’ll want to learn the basics of hand signals so that others on the road know where you’re heading. When you’re turning left, stick out your left arm straight out. To turn right, do the same with your right arm. Holding you left hand by your side pointing to the ground will indicate to others that you’re stopping. And it’s always good to get familiar with your Blue Bike before riding, ensuring that the seat fits your height, the tires have enough air and you fully understand how to use the brakes. These bicycles are specifically designed for city riding and are fully adjustable to accommodate riders of all sizes or skill level. 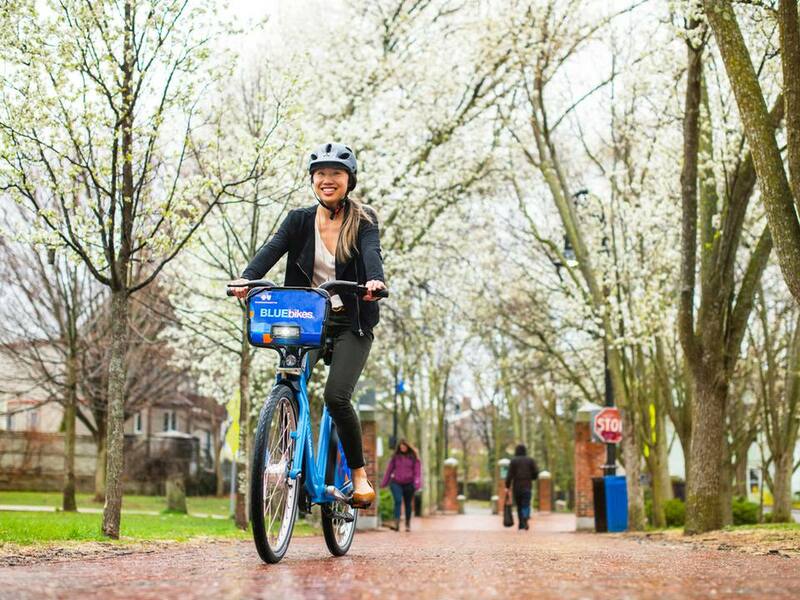 More information on the Blue Bikes’ features can be found here. Assuming you’re riding in good weather, it’s hard to go wrong taking the Blue Bikes out around the city of Boston. Popular rides to explore include the Charles River Esplanade, Boston Harborwalk, Cambridge Reel Ride, the Southwest Corridor, Somerville Community Path and the Landmark Centre, Fenway Park and Kenmore Square.